After a successful season opener of Thursday Night Football with a jump in ratings and plenty of high-tech innovations, Fox Sports looks to cap off its 2018-19 NFL Campaign in style with the NFC Championship on Sunday in New Orleans. The Rams-Saints matchup will feature many of the tools that became staples of Fox Sports’ TNF and Sunday A games this season — including dual SkyCam systems and an army of Sony 4K and high-speed cameras — as well as an onsite edition of the Fox NFL Sunday studio show produced in 1080p for the first time. Of the the 40-plus Fox cameras on hand for Sunday’s production, nine will be high-speed systems, including nearly all field-level cameras. One Sony HDC-4800 will be shooting in 4K from the high–end-zone position; another will be on the sidelines shooting at up to 16X slo-mo (in HD) to capture NFL Films-type cinematic shots. Launched at last year’s NFC Championship, the latter has become a key tool in creating cinematic replays for both the game broadcast and pregame show. In addition, seven Sony HDC-4300’s will be shooting at frame rates ranging from 3X to 6X to even 8X, depending on their locations in the stadium. PylonCam systems will be covering both end zones, while an RF Steadicam and an aerial blimp will also be on hand. As has been standard for all of Fox’s TNF and Sunday A games this season, two SkyCams (a high and a low) will cover the action — both capable of displaying SMT augmented-reality graphics. In terms of audio, the 5.1-surround production will be headed by Sports Broadcasting Hall of Fame A1 Fred Aldous, with Eddie Verstraete overseeing the on-field–audio submix. Aldous and company will be tasked with capturing sound from what is surely to be a raucous atmosphere inside the Superdome. The Fox NFL Sunday studio show, which was just announced as a 2019 NAB Broadcasting Hall of Fame inductee, will be onsite. For the first time, it will be produced in 1080p (games are already produced in the format) during this season’s playoffs (although it is downconverted for distribution to the home). Sunday marks the second road trip for Fox NFL Sunday this season, following a visit to Fort Benning, GA, on Veterans Day weekend. 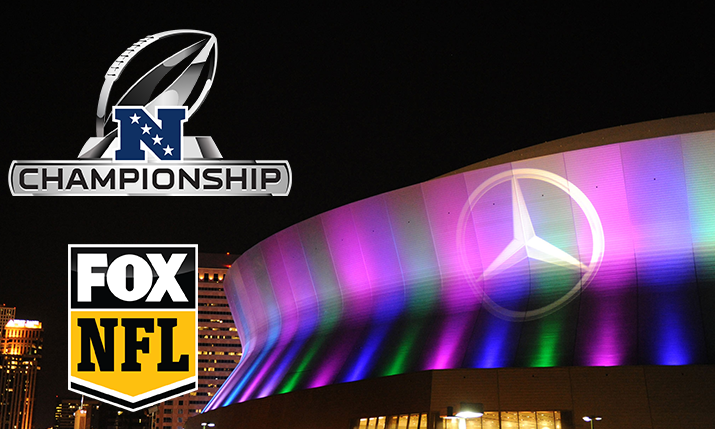 According to Davies, of all the potential NFC Playoffs venues, the Superdome is ideal for the studio show since it is indoors and has suitable spots for an on-field set. Fox will use Game Creek Video’s Pride mobile unit for the pregame show (the same truck used for NFL Network’s TNF Pregame show during the regular season), and it will be integrated with the network’s main game truck, Game Creek’s Encore (A, B, and C units). Joining Russo in the truck for the game production will be TNF producer Richie Zyontz and TD Colby Bourgeois. Pete Chalverus is technical producer. Although this weekend game will be among the most the most high-tech productions of any football game this season, Davies sees the world-class crew as Fox’s main differentiator this weekend. In the first year of a five-year deal for TNF, Fox not only was able to launch a “second A game” package on top of its already sizeable number of NFL games but also created a brand-new Thursday Night Football Pregame Show at Fox News Channel headquarters in New York City. “I’m really proud of how quickly we were able to build up TNF,” says Davies. “We didn’t have a ton of time to put this in gear and all of the things that needed to happen — not only on the road but also in the studio in New York. There’s no question, TNF would not be what it was this [season] without the hard work of our crew. Of course, Fox Sports operations team accomplishments go beyond TNF. Fox made incremental upgrades to its game productions and, for the first time, worked with CMSI to provide every NFL on Fox production full file-transfer capabilities between the remote and its L.A. headquarters. Davies and company have already been working on operational plans for Super Bowl LIV in 2020 for the better part of a year.